Are you jetting off somewhere soon? Whether it's a short city break or a far flung adventure, let us help you take care of your skin on the go. 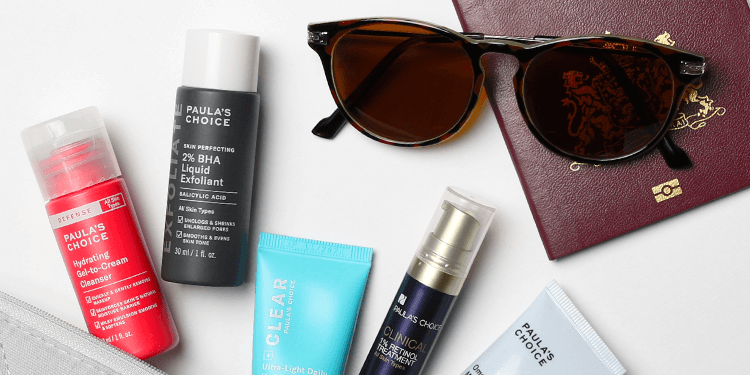 Discover your favourite Paula's Choice Skincare products in cabin-friendly sizes - perfect for hand-luggage, they will last up to two weeks. Air humidity in an aircraft is much lower than on the ground, which can leave your skin feeling dry and tight. Due to the extreme dryness, your skin may also end up producing more sebum – resulting in clogged pores and breakouts. Give your skin some SOS with the following in-flight skincare plan. Gentle Cleansing Cloths: First clean your skin to remove makeup and dirt. These gentle cleansing wipes will remove even stubborn waterproof makeup while moisturising your skin at the same time.They're a great way to keep your hands clean on the flight too. Hyaluronic Acid Booster: If you're on a long-haul flight, this super-hydrating booster will counteract tightness and restore the skin's moisture balance. Defense Antioxidant Pore Purifier: This product unclogs your pores and also protects skin from the effects of recycled cabin air. Radiance Renewal Mask: Hydration is the keyword for radiant skin on or after a flight. Using this mask on the plane will combat dehydration and replenish skin with vital moisture, so that you arrive at your destination with radiant, hydrated skin. Resist Anti-Aging Primer Serum SPF 30: Restrictions on liquids make it impossible to bring your entire beauty cabinet, so this three-in-one product is a must-pack! It combines a nourishing serum, a primer for your makeup and sun protection so that you step off the plane hydrated, protected and ready for the sunshine. Resist Skin Restoring Day Cream SPF 50: If you arrive during the day, it is essential to apply an SPF. This day cream with SPF 50 offers higher sun protection (ideal for exotic destinations) and moisturises dry skin, counteracting post-flight dullness. Omega+ Complex Night Cream Flying overnight? Boost your beauty sleep with our newest Omega + Complex Night Cream, which restores skin's moisture balance and strengthens its barrier. These skincare steps are just a guide - feel free to adjust to your skin type and preferences. The main thing is to keep skin hydrated during and after your flight, so that you arrive at your destination radiant and refreshed. Keep your skin glowing all holiday with our handy travel sizes, which last up to two weeks. Bonne vacances! ...that exposure to oxygen and sunlight can make your skincare products less effective? That's why it's always best to use our travel sizes instead of transferring products into containers. Transferring products to pots or jars means they are exposed to oxygen every time you open them, as well as bacteria from your fingers – making them less effective and reducing their shelf life. Active ingredients such as antioxidants protect the skin against free radicals and restore skin from environmental damage, so if these ingredients deteriorate, you will be less protected.